HIPPOPHAE BERRIES are one of the most abundant natural sources known to man. They provide a plethora of both internal benefits as a supplement and external age-preventative and skin-beautifying properties. They have been used for centuries as a remedy for wellness, health and beauty, predominantly in Europe and Asia. These miracle berries are accompanied by an ancient legend passed down from one generation to the next, originating from Eastern Europe. The story behind Hippophae berries begins with a young Siberian woman who got lost in the forest. As her anxiety grew, she began running in fear, not seeing anything in front of her. She frantically ran through the woods, not feeling the tree branches and thorns tearing at her skin. When she reached the river, she was terrified by her own reflection; her face was covered in scrapes and wounds. Standing next to her was a beautiful plant with berries. In desperation, she crushed and rubbed the berries all over her assaulted skin and cried herself to sleep. When she awoke the next morning, she leaned to the water to wash her face, and saw in the reflection that her skin was miraculously healed. 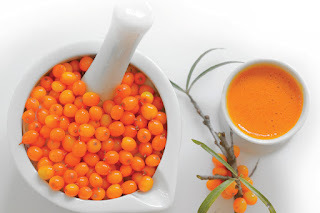 Those magical berries were Hippophae, also commonly known as sea buckthorn berries. Hippophae oil, the usable form of hippophae berries, is derived from two sources: the seeds and the pulp of hippophae berries. 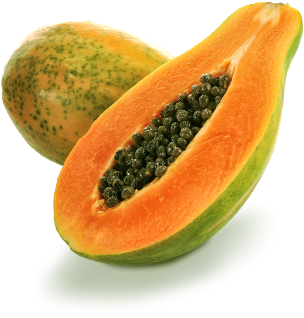 The seeds contain one of the highest and purest percentages of vitamin E, and the pulp contains extraordinary amounts of carotenoids, including vitamin A, beta-carotenoids and its derivatives. Carotenoids are responsible for the unique reddish-orange color of the berries. In addition to these powerful carotenoids, hippophae berries’ very long list of bio-active, skin-soothing and anti-aging elements includes flavonoids, organic acids (e.g. folic acid), oleic acid (omega-9), linolenic acid (omega-3 and omega-6), arachidonic acid (omega-6) from vitamin F, palmitoleic acid (omega-7), thiamine (vitamins B1), riboflavin (vitamin B2), vitamin E (alpha-tocopherol), vitamin C (ascorbic acid), vitamin K, phospholipids and minerals. Consumed as a liquid oil supplement or tea, hippophae oil helps to boost health, strengthen and stimulate cell regeneration for beautiful hair, skin and nails. In addition, the micro-elements biologically available in the berries — including magnesium, calcium, copper and potassium — encourage healthy bones. Furthermore, its powerful antioxidant properties defend against and neutralize damaging free radicals, making it a potential anti-carcinogen. Hippophae berries help promote younger-looking skin. Vitamin K in hippophae berries works rigorously to maintain skin elasticity and firmness. The combined action of vitamins K and A enable a skin brightening effect. Furthermore, folic acid in combination with B vitamins stimulates cell proliferation, which helps minimize the appearance of fine lines and wrinkles. Hippophae effectively encourages the purging of backed-up sebum in the sebaceous glands. Sebum that does not have a way to exit the pores inevitably triggers infection, often resulting in acne. The fatty acids in the berries are non-comedogenic — because they do not clog pores, they are able to treat and decrease the severity of future breakouts as well as combat acne. Vitamin B is recognized for its anti-stress benefits as well as its effectiveness in maintaining healthy blood cells, both critical in the treatment of rosacea. The balance of natural, self-generating lubricants on the skin is improved through the remarkable action of vitamin B, folic acid and vitamin K.
The synergistic, combined action of vitamins E and C allow the skin to naturally protect itself against UV sun exposure. With ultraviolet radiation being such a prominent cause of skin cancer, Hippophae berries not only halt sun related tissue damaging, they also function as a powerful skin cancer deterrent. Hippophae berries are known for being nature’s exclusive source of the rare omega-7 fatty acid, which is why they are extensively used for their healing properties across Eastern Europe and Asia in burn victim clinics. The large volume of vitamin F oil-soluble fatty acids (comprising linoleic, linolenic and arachidonic acids, referring to omega-3 and omega-6) create a barrier for the skin, allowing the skin cells to reproduce and ultimately become smooth and even-textured. Incorporating products rich in Hippophae berry oil into spa treatments goes hand-in-hand with offering clients a wellness treatment that works from the outside in. It is a safe ingredient that can benefit most clients, whether as part of a signature anti-aging facial treatment utilizing the age-defying actives, or for the breakout-prone client to improve and expedite the healing process of blemishes. With its powerful cell-repairing abilities, Hippophae effectively regenerates scar tissue, even minimizing and preventing mommy-to-be stretch marks. While Hippophae can greatly enhance the efficacy of skin, body and hair care products, the powerful, rapid healing properties of the berries also make it an effective skin remedy after harsher treatments, such as chemical peels, dermabrasion, laser resurfacing and dermal needling. A signature Hippophae-rich facial treatment typically ranges from $85 to $150 for a 60-minute session and can be done to smoothen fine lines and wrinkles, repair breakout-prone skin or simply transform the skin’s vitality and tone, revealing a radiant complexion. With all the vitamins, acids, omegas, flavonoids and minerals contained in Hippophae berries, consider concluding your clients’ next transformational skin and body wellness treatment with a relaxing, health- promoting cup of Hippophae tea! Written exclusively for Les Nouvelles Esthetique & Spa Magazine.